The AQHA Executive Committee approved several recommendations from the AQHA Animal Welfare Commission at the 2017 AQHA Convention. The recommendations ranged from adding specific medications to the AQHA forbidden drugs or substances list to creating educational efforts for specific animal-handling procedures to a recommendation to use all drug- and animal welfare-related fines to support the AQHA steward program. – Fines generated from drug and animal welfare violations be placed in the animal welfare budget to support the steward program. – AQHA should encourage show managers to establish an isolation protocol at AQHA shows using the industry-developed template to ensure horses on the grounds are protected should there be a disease outbreak. In addition, show management should be encouraged to conduct practice runs or audits to ensure proper procedures are carried out. – Develop a one-page educational flyer to educate exhibitors on the importance of vaccinating their horses for equine influenza virus and equine herpes virus prior to entering AQHA show grounds. – AQHA staff should continue work on an educational flyer regarding reporting animal abuse. – Form a joint task force made up of members from the Animal Welfare Commission, Professional Horsemen’s Council and the Show Format and Procedures Subcommittee to discuss options to increase AQHA Steward presence at shows. – Effective immediately, the “use of any drug, chemical, foreign substance, surgical procedure or trauma that would alter a horse’s normal tail function”be added to the prohibited inhumane practices set forth in AQHA Rule VIO204. – Form a task force to review AQHA’s definition of normal tail function. 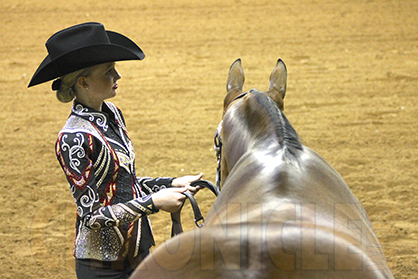 – Effective immediately, AQHA stewards can show at AQHA events that they are not assigned to steward. – Effective immediately, allow hydroxyzine to be submitted on a medication report form as long as all requirements of AQHA Rule VIO403 are met. – Effective January 1, 2018, and with respect to the medication rules that govern show horses, furosemide (Lasix) will be removed from the list of conditionally permitted therapeutic medications and added to the list of forbidden drugs or substances in AQHA Rule VIO401. – Develop and publish a list of medications that can be reported on a medication report form as long as all requirements of AQHA Rule VIO403 are met. Develop and publish a list of forbidden substances. – Effective January 1, 2018, add hair testing to AQHA Rules VIO302 and SHW120.1. For more news from the 2017 AQHA Convention, visit www.aqha.com/convention. The AQHA Animal Welfare Commission, which was created by the Executive Committee in 2012, reports directly to the Executive Committee, which evaluates all proposals in relation to the current state of the industry. The Animal Welfare Commission serves as AQHA’s primary body for rules, policies and procedures related to all areas of animal welfare. In addition, the commission oversees the educational processes associated with AQHA officials responsible for animal welfare. The Animal Welfare Commission’s mission is to provide a framework for its members to 1.) Identify issues negatively affecting the welfare of the American Quarter Horse, 2.) Stay current on all animal welfare issues and 3.) Recommend actions that will help to protect the American Quarter Horse from inhumane practices and AQHA and its members from the negative impacts associated with those practices. The AQHA Animal Welfare Commission, in an effort to do right by the horse, will share discussion, action items and recommendations with alliance partners.